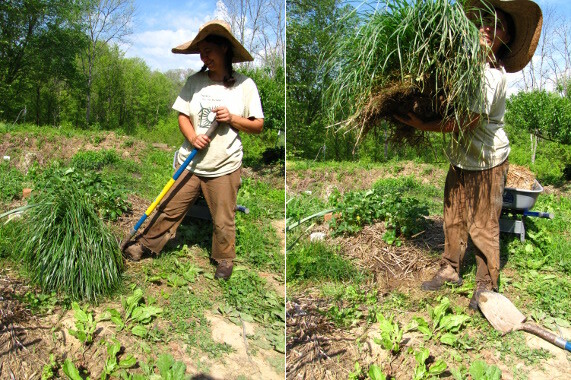 The saying that you spend 90% of your time carrying out 10% of the tasks in an average job is true in the garden too. 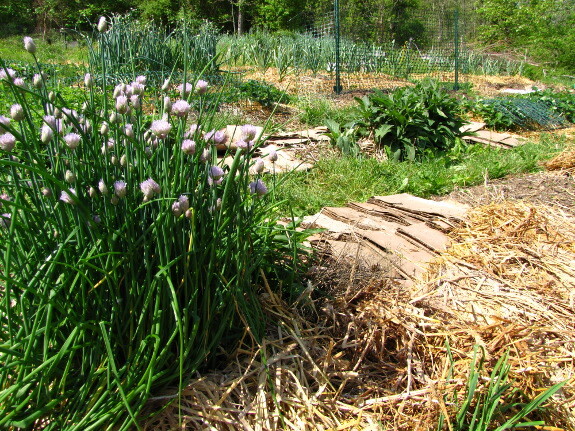 Taking a few minutes to root out inefficiencies really pays off, even though it seems hard to budget the hours when putting in your spring garden. This year, we've been focusing on making it easier to mow the garden aisles. Clumps of tall fescue, like the one I'm digging out in the top photos, bog down the mower and take several extra seconds (and quite a bit of brute force) to trim down. It doesn't sound like much, but once you've hit ten clumps of fescue, the time (and hassle) adds up. We're slowly but surely rooting out these problem grasses, leaving the more well-behaved bluegrass and white clover to take their place. 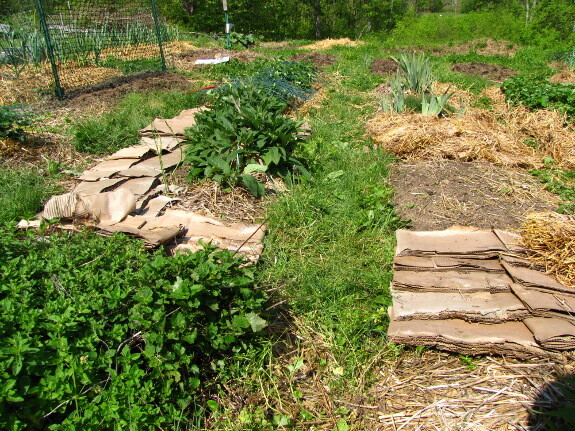 So I'm spending a few extra minutes to lay down a kill mulch and turn the cross-aisles into part of long, linear beds. This year, I'll just let the grass die back under the cardboard, then this fall I'll plant an oat cover crop to start building the soil up in these new garden spots. I figure by next year, I'll be able to plant vegetables, increasing my growing area while also making the garden easier to maintain. The only slight disadvantage of my bed merger is that now I'm going to have to add decimals to my numbering scheme. It already has negative numbers --- how geeky can you get? 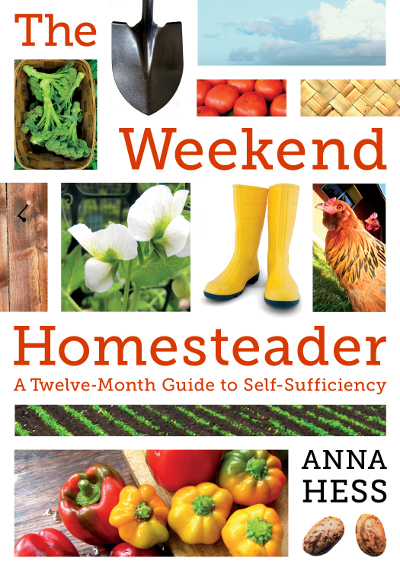 Weekend Homesteader: May contains a whole chapter on tricks for planning an ergonomic garden. The chapter has been expanded and moved to April in my new paperback. So, putting down a thick kill mulch now and seeding one round of oats should yield enough biodegraded material in which to plant next spring? Or do you plan on doing more than one planting? Mitsy --- It totally depends on the quality of your soil. This is in the high quality soil of the front garden, so I could plant directly into a kill mulch there as soon as the grass is dead, as long as I added some compost to counterbalance the carbon of the decomposing weeds. But since I don't need that space yet, I'll just wait. The oat cover crop will be providing additional organic matter to the soil, but not much nitrogen. So, if you're following my lead, be sure to still apply plenty of manure and/or compost in the spring before planting! Slightly off topic but have you added any more bio-char to any of your beds recently? Any updates on conditions of your original bio-char application? Thanks! Brian --- Good question! I keep meaning to write another followup, but there's nothing new to say. We saved all of our charcoal from the winter, soaked it in urine, and then applied it to halves of three new garden beds. I'm keeping notes on where I'm putting each application since it usually takes at least a year, maybe multiple years, to be able to tell the biochar effects. I'll have to pay attention this year to beds we applied biochar to last year to see if it's making any difference. That sounds like what I should post about. Huh. Numbers. Who'd uv thunk. I use letters, A, B, C, D and then have little key codes as to what is going in which bed in combo. Maybe a better way to do it is to name it like we name our computers, and wireless routers, and server etc. Or after shakespearean names. Or... anything NOT plant related. Do you also think in North South East West directions? I'm one of the only women I know who does in my generation. 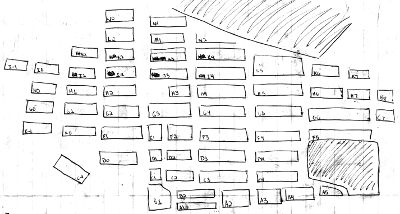 My dad used to give directions to find a hammer or a particular drill bit this way "West side of pole barn, 3rd bay from the north, bottom right side." And the item was always there. I have names for the bedrooms in my house "west room" "south west room" it drives my husband crazy.